Physical Vascular Therapy is used in a diversity of fields today. The improvement of microcirculation, i.e. blood flow to the smallest blood vessels, benefits your health, your immune system and your overall sense of well-being in a variety of ways. Based on years of experience, BEMER has continued developing Physical Vascular Therapy – making some ground-breaking findings on the biorhythm of local and higher level regulatory processes. An effective stimulation of microcirculation supports the body’s most important control mechanisms for prevention, healing, recovery and regeneration processes, and can also be used for numerous applications and indications. EPO may also be used to relieve the painful side effects from eczema and dermatitis, and is also known to ease breast tenderness from premenstrual syndrome (PMS) and hot flashes from menopause. Adrenal SP by Dr. Lam provides 20,000 units of serratiopeptidase per serving. Serratiopeptidase, also known as serrapeptase, is a protease found in the the gut of silkworms. Alive! Vitamin C by Nature's Way is a 100% whole food complete vitamin C, just the way mother nature wants it! Alive! Vitamin C contains four organic sources of Vitamin C: organice goji berries, organich kiwi fruit, organich amla fruit, and organic acerola berries. Candida Gone helps to support a healthy balance of intestinal bacteria. The beneficial bacteria that normally populate the gut assist in the digestion of food, produce certain vitamins and promote detoxification processes. ImmunoPax by Dr. Lam provides a combination of herbs, mineral, and vitamins that may boost or support your immune system and overall wellness. BGM by Dr. Lam is a proprietary blend of Beta Glucan and Maitake Mushroom. Beta Glucan is a bioactive carbohydrate derived from the cell wall of Saccharomyces cerevisiae, commonly known as Bakers' yeast. Scientific studies have shown that Beta Glucan supports immune function through its ability to stimulate macrophage activity. Maitake Mushroom is a medicinal mushroom that are rich in antioxidants, Beta Glucan, amino acids, vitamins and minerals. Maitake also support overall immune function. 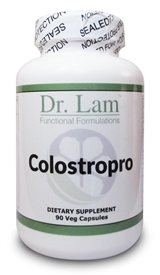 Colostropro by Dr. Lam contains a proprietary blend of bovine colostrum along with probiotics to support your gut health and immune system. Adrenal Cordyzyme by Dr. Lam provides a proprietary blend of cordyceps with digestive enzymes. Dr. Lam Chloro BC is a green single-celled microalgae that contains the highest concentrations of chlorophyll known (60 mg/serving). MesoSilver is 0.9999 pure silver in colloidal form. MesoSilver is non-toxic and will not cause Argyria. MesoSilver has the highest particle surface area and made using the sterile, highest purity pharmaceutical-grade deionized water. MesoZinc is 0.9995 pure zinc in colloidal form. MesoZinc is non-toxic and has a high particle surface area. MesoZinc is made using the sterile, highest purity pharmaceutical-grade deionized water. MesoCopper is 0.9999 pure copper in colloidal form. MesoCopper is non-toxic and has a high particle surface area. MesoCopper is made using the sterile, highest purity pharmaceutical-grade deionized water. Colostromax has been replaced by Colostropro! Parapax by Dr. Lam is a proprietary blend of traditional herb extracts that are known for being antiparasitic, antiviral, and antibacterial. Parapax is a blend that may support parasite cleansing and assist digestion. HomeoPlex is a line of homeopathic formulation by LAM MD. HomeoPlex U is a proprietary blend that supports the body's healthy immune system. Dr. Lam's Adrenal Broth provides vital basic and foundational macronutrients sorely needed in advanced adrenal fatigue recovery. Dr. Lam's Adrenal Broth provides you with the benefits of bone broth in a convenient form.